After having planted two 10m+ bamboo poles in the ground yesterday, we raised the Koinobori carps today with two monks of the temple. Since I stood nearest to the pole, I had the honour to raise them. 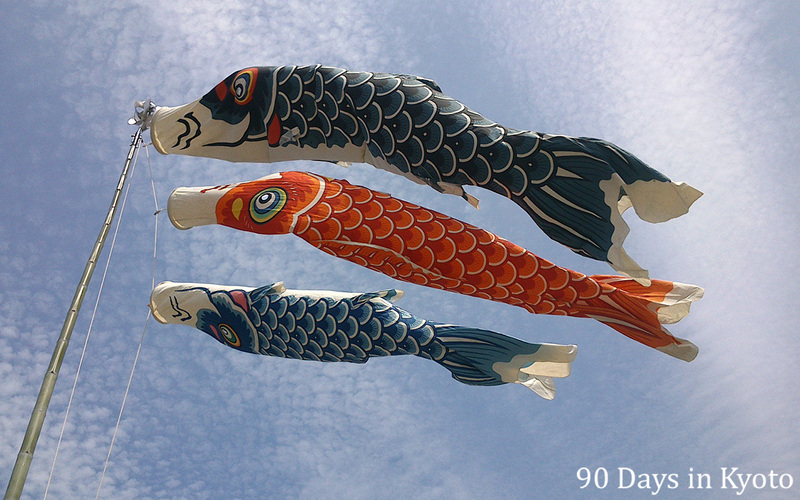 From mid-April to early May, colorful carp streamers are fluttering in the wind all over Japan. They mark the Kodomo-no-Hi, the Children’s day on May 5th. The biggest carp on the top is the father, the second is the mother and the smallest is the junior of the house. Planting the bamboo poles in the ground sounds easy, but the I realized how many steps are involved. First we had to choose the right bamboo pole (not too fat or too thin, more or less straight). Cut it, wash it. Then dig holes for planting it and a supporting structure. Digging holes took us newbies a while – sounds easy, is difficult. Then carrying it with four people through a narrow but busy street in one of Kyoto’s most popular sightseeing areas. Adding a rope to put the wind socks on and adding ropes which help to control the pole while erecting it. Then erecting it without damaging the wooden structures of the temple. Then tying it to the supporting structure and climbing a high ladder to take off the ropes. Finally, adding the carps and raising them so they fly 10m high in the sky. I realized how many steps are involved to make anything. Today I was told to do some carpenter work – exchanging a wooden board which covers a gutter. After discussing it with the head gardener, we built a custom gutter cover, which fits perfectly on the supporting stones. We had the time to do it right, so we did, although it is just a board over a gutter that no visitor will ever see. Training is for reality, reality is for training.